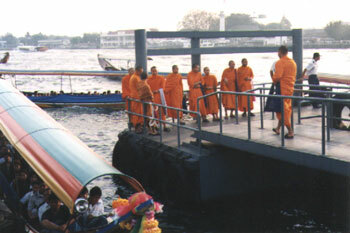 Monks await the ferry boat on the Chao Phraya River in Bangkok. Nearly 95% of Thai men are monks during some period of their lives. Of Thailand's 60 million people, the monkhood (sangha) consists of about 250,000. Most teenage boys become monks for a few months, a rite of passage that brings merit to their families. Thai women who live the monastic life wear white robes and engage in the same meditation and Dharma study as monks. Red, green, orange, and yellow are colors associated with Theraveda Buddhist art and architecture. Note their use here on the ferry boat canopy.